To complete a missions successfully often required many tools, and these were the tools of the trade for the successful ninja warrior. To pass through locked doors, the ninja would arm themselves with lock picks. To distract their foe and make a hasty escape the ninja would employ distracting tools, like their smoke bombs, and firecrackers. If they needed to place obstacles in the way of chasing enemies then the ninja could deploy some makibikshi. I could go on with more examples, but I wont. What you should have realised by now is that for every situation, the ninja had a suitable tool as a solution. They would be capable of choosing the right tools for the job, and they had plenty to choose from. Let’s explore the various tools the ninja used. These picks were primarily a way to create holes in walls to easily spy and assess a property. The smoke bomb was used to create confusion, provide a diversion or even as a distraction for a ninja. The torinoko was created from a piece of paper with a paper fuse and filled with gunpowder. The ibushi-ki smoke pot was a lightweight ceramic pot, small in size with holes along the side and in the top. The pot would be filled with gunpowder, and once lit and would billow smoke for a prolonged period, offering more defence or a longer opportunity when looking for distraction over a smoke bomb. The hyakuraiju were a series of gunpowder firecrackers linked together with a fuse, that once lit and set off was cause a chain of small explosions. It was common for these hyakuraiju to be cylindrical tubes with a solid base and the fuse linked in the top. The Ninja used this tool to confuse the enemy and distract them. Once set off the Hyakuraiju could look to the unknown as those there was a large number of armed enemies, and in this way this small tool could be hugely powerful. Makibikshi was a term used by the ninja for small pointed or edged objects that the ninja would lay on the ground to hamper the enemy in case of a retreat. The ninja would throw a group of makibikshi on the ground, which would spike anyone in the foot who was to stand on it. A tetsu-bishi, an Iron makibikshi used by ninja to lay on the floor. The iron makibikshi were custom built with the purpose to injure and aggravate the ninjas foes. The makibikshi would come in a variety of styles, from pyramid shapes, to tetrapods with four points, ensuring one would always be facing up. The natural makibikshi used by the ninja were made from hard seed pods or shells. These pods were naturally pointed and very strong making a useful covering to slow down pursuing enemies. The iron claws were used by the ninjas to climb and scale walls where getting a finger hold was difficult. Additionally the claws could be used as a weapon or even as a way to defend against blade attacks if necessary, but likely their primary use was for climbing. A ninja iron claw, known as a tekko-kagi. The karakuri-kagi was similar to the maru-kagi, and was a lock pick for a larger, bigger lock. One of the many skills of the ninja was the ability to scale, climb and gain entry. 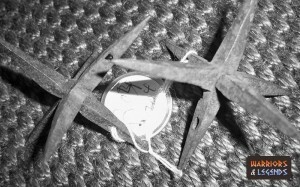 To do this the ninja utilised many ropes and hook, and the kagi-nawa was a simple u shaped single point hook that would allow the ninja to scale walls and high fences. The Ikari-kagi or the grappling hook was the more versatile version of the kagi-nawa. The grappling hook sported a four point anchor that would prove useful where visibility was low or non-existent, or when the ninja needed to hit a point the first time. The Shuko were spiked hand grips, made from leather and metal that the ninja wore facing inward from their palms. The spikes were easily placed onto the hands, allowing the ninja more grip when scaling and climbing. The Ashiko described below are essentially the same but for the feet of the ninja. 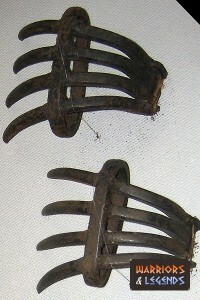 A pair of shuko, the ninja’s spiked hand claws used by them to assist in climbing. The Ashiko were typically metal spikes worn over the foot of the ninja. It’s thought the Ashiko were made of leather and metal. 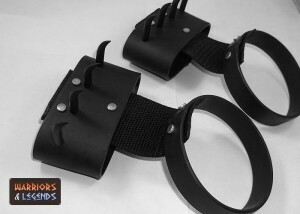 These were easily wearable and removable, allowing the ninja to quickly bare them when scaling or climbing. The points on the ashiko would be especially useful on wood, but also an aid on stone or brick walls. The ashiaro were one of the stealth tools employed by the Ninja. These wooden carved footprints would be attached to the soles of the ninjas tabi’s and mimicked the shape of animal footprints or even small children’s footprints. By utilising these footprints the ninja were able to cover evidence of their presence on stealth mission. The ninja used the Tojime to lock the sliding Japanese doors behind them as they progressed through buildings. The Tojime was simply a metal bar with duel hooks allowing the ninja to effectively fasten a door shut. While carrying out missions, the ninja would often have need to gain entry to buildings, rooms and structures, and a saw known as a Shikoro was a useful aid for this. For daylight mission the ninja would be able to see clearly what to do, but at night darkness could prove to be the enemy of the ninja. To solve this the ninja would often carry small lanterns to provide light. These lanterns were called Gando’s and were a short candle mounted in a single windowed metal cone shaped lantern. The Gando with only one window allows the ninja to direct light were needed without bringing to much attention to themselves.